Hydroponic Gardening can be a fun activity with rewarding results. These results, however, beg the question can I do this to make money as a commercial venture. We then look to expand out of the hobby growing scenario and move to a more serious production-based method of growing. This move fueled by a desire to see hydroponics as a viable, sustainable and profitable venture would mean changing the outlook from a hobby grower to one that will use data and replicable models to attain growth throughout the year. Firstly commercial hydroponics farming in Hyderabad or Chennai or anywhere will first need a careful examination of existing resources. Top of the list being open flat land, water, and electricity. Next would be to specify the type of hydroponics, climate control, and polyhouse that one will use to achieve this kind of farming on a large scale. These components will decide the kind of crops that you can grow throughout the year. One must remember to survey the market and see the viability of growing particular crops at a particular time of the year. For example, one doing hydroponics in Gurgaon it would profitable to grow lettuce in summer but resort to things like swiss chard or kale in winter when lettuce supply is usually more abundant. 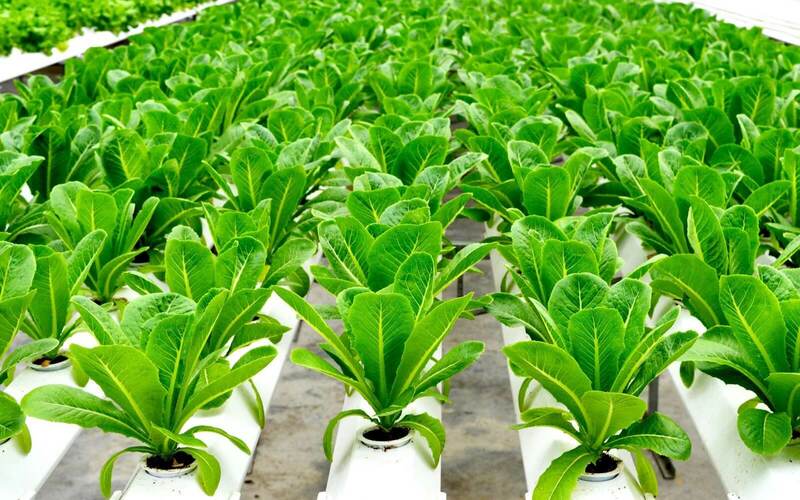 The type of hydroponic equipment used will dictate what one can grow in their farm, A NFT set up would likely work for leafy greens and herbs but would not be successful in growing larger rooted crops. A DWC system or dutch bucket system would make the cultivation of tomatoes or strawberries much easier. Another factor to consider is the type of climate and temperature for growing a plant needs, set temperatures can be achieved with the use of climate control such as air conditioners, fan and pad systems, and even chiller tanks to reduce water temperatures. Material that a polyhouse is made of can also help with temperature control. The most important aspect is the market. Does it make sense to invest a vast amount in a technologically advanced farm with better quality and quantity of output? Does my market need the benefits that hydroponic growing give? Does it market as a better product than its soil or organic counterparts? The answer to this can only be tested with a marketable product, there is always a need in one part or another for production of a particular crop variety and hence one must constantly look for new opportunities to refine current crop production methods to achieve better yields or quality and look at new crops for more options of products to take to market. Packaging and collateral educating people of the benefits of these crops is also something farmers must focus on to spread the word of the little-known benefits of this type of farming. The shift from hobby to commercial growing means more thought on the overall product than just the growing, with hydroponics we can use data to follow fool proof growing SOP’s to get recurring and consistent quantities and qualities of the crop but selling the end result is the main gateway to running your farm profitably.